Have you ever been happily in love? I haven’t, but I bet it’s a lot like “Baby Driver.” There’s an initial jolt that you try to piece together before the real action sets in, dragging you willingly on an up, down, all-around ride of emotions, shaded by too optimistic longings and lingering past regrets. Feeling a combination of doo wop pep and Springsteen-y open-road romanticism, I left the theater shouting “I am so happy!” while stumbling into a blocked off construction area semi-unawares. I was on my way to the subway, but oh, what I’d have given for a beat-up jeep with a glove compartment of outdated maps and a mixtape of the “Baby Driver” soundtrack (which does not include either doo wop or Springsteen). Critics are calling “Baby Driver” an adrenaline-pumping thrill ride with heart, noting its technical prowess and expertly-chosen set list, but as with all great movies, there’s much more to it than that. Edgar Wright has been dubbed the “ultimate fanboy turned filmmaker,” but again, there’s so much more to his unadulterated love of movies. Wright has become a champion of cinema not only through his films, but on social media and the repertory theater scene in a refreshingly endearing and resoundingly engaging way. “Baby Driver” pushes past the parody safety net of his previous work into astonishingly authentic and original filmmaking. This latest film cements Wright as a true cinephile director, boldly and intoxicatingly sharing his near-maddeningly love with all of us. Wright infuses his work with adept, basically self-taught, technique and the sort of film fluency that can only come from extensive film watching and research combined with an even more imperative passion for the medium. At 14 years old, Wright shot amateur shorts on a Super-8 camera and charged 50p admission to screenings during school lunch breaks. At 18, he made three hour-long films with his classmates—a superhero film, a cop film, and a Western spoof. At 21 (and as a film school reject twice over), he took a feature-length version of that last one, “A Fistful of Fingers,” to the Cannes Marché du Film (our revisiting of that film can be found here). Wright’s films follow a simple through-line of an empathetic, though not entirely wholesome, lead facing insurmountable odds under outlandish circumstances in otherwise ordinary settings. Utilizing the same formula for both comedy and horror gags (in terms of timing, composition, and surprise), his style leans into genre filmmaking, alternating between ironic, witty, and edge-of-your-seat effect. With scads of references ranging from “Scooby Doo” to “The Shining,” this in itself becomes an homage to the reflexive nature of film and the likes of Alfred Hitchcock, John Landis, Quentin Tarantino, and so many more. As a television director, Wright trained in absurdist sketch and stand-up comedy as well as out-of-the-box sitcoms, exploring the lines between parody and homage. In “Asylum,” a pizza delivery boy stumbles into a countryside psychological experiment, with echoes of “The Haunting” and touches of “The Twilight Zone” amped up to sketch comedy speed. In “Spaced,” two Londoners struggle through the tribulations of 20-something life to the rhythm of classic horror and action movies (check out the DVD’s homage-o-meter subtitling setting for a full list) and the authentic off-beats of anxiety-ridden wasted youth despondency. You don’t have to be a genre expert or know all of the references to fully enjoy these shows or his later movies. His filmmaking style leaves both the casual moviegoer and the oft-skeptical cinephile with the same level of intoxicating enjoyment. The thrill is that you laugh, you jump, you grin, your heart races, you feel both the past and the present in a fleeting-yet-continuing instant. The beauty is in the music-synced fight and footwork, quick-action pans and jolting reaction shots, the no-or-little-cut sequences seamlessly lingering on the protagonist’s POV. The sublimity is that the experience sticks with you and the effect sets your actual world to a reinvigorating positive cinematic-magic beat. All of this makes the viewer not only want to rewatch that one film or the rest of Wright’s filmography (to revisit, to pick apart, to ride again), but to also explore more movies and revisit their own film loves, without the shaming, exclusivity, or one-upmanship regularly associated with film obsessives. Speaking about “Spaced,” Wright has said that he aimed for the show’s tone to be making the mundane look melodramatic. To go one step further (and to trample into a cliche), his films make the ordinary extraordinary. A middling electronics salesman steps up to become a zombie killer. The “Village of the Year” turns out to be a conspiracy-infested den of multiplicitous horror. A slacker musician Mortal Kombats his way to winning his lady love. A nostalgic pub crawl of 40-somethings becomes a battle of the worlds, both metaphorically and literally. In “Baby Driver,” Wright takes car chases and bank heists to rock-operatic heights off-set with resoundingly heart-thumping and thudding emotions. “Baby Driver” brushes off the parody in Wright’s previous work while retaining his signature wit in a sharp-and-quick script. It is a serious film with life-and-death actions and consequences weighted by the emotional investment we place on 20 year-old Baby and the career car heist-set stakes. Unlike Henry Hill (though the film is laced with “Goodfellas” references), Baby never wanted to be a gangster, he just wanted to drive and wound up in the wrong crowd due to a childhood tragedy and later mistake. He listens to music near-constantly to drown out chronic tinnitus, being particular on the timing and the song’s rhythm, but not so much on the player, alternating between iPod, vinyl, audio cassette, and car radio. Similarly, his set of skills isn’t determined by the car he’s driving, but by his focus and reflexes to the beat of whatever’s playing. Wright takes a powerful singular vision and fleshes it out with awe-inspiring detail and verve. “Baby Driver” manages to capture the best of competing genres, blending but never dulling the elements that make them great. The lead’s lithe lank through an Atlanta city street becomes a smooth walk-dance hybrid. The romantic interest reveals herself to be a soul mate with like-minded yearnings underneath her manic pixie dream girl trappings. The heists get rougher and the characters get darker, with the piper never quite paid in full. The concept behind “Baby Driver” has been long-gestating. At 21, newly moved to London and not yet a proper film director, Wright listened to “Bell Bottoms” by The Jon Spencer Blues Explosion and immediately envisioned an accompanying bank heist with this song being listened to by the getaway driver. Through the years, he’d revisit this idea and add on to it as more songs (“Tequila” by Button Down Brass, “Hocus Pocus” by Focus) inspired more sequences (gunfight, on-foot and in-car chase sequence), as he described in detail in his interview with Nell Minow. He gave “Baby Driver” a test run in the 2003 music video for “Blue Song” by Mint Royale, which makes a blink-and-you’ll-miss-it cameo in the finished product of “Baby Driver.” Wright wrote the first full-fledged draft of the screenplay in 2010 and got the production gears in motion in 2014. As further though very specific, possibly stretching, proof that the idea was almost always on his mind, the action in “Blue Song” takes place in a 1982-ish Ford Granada Ghia while Wright’s last film before “Baby Driver,” 2010’s “The World’s End,” heavily featured a similarly dated Ford Granada Ghia X. Wright himself has never driven a Ford Granada and openly admits to occasionally driving a Prius. Another very direct inspiration for “Baby Driver” was Walter Hill’s “The Driver” (the 1978 car-heist film starring Ryan O’Neal as a quietly enigmatic getaway driver). In one scene, a portable audio cassette player plays “Help Yourselves To Each Other” by Don Williams when The Driver (O’Neal) hears a knock at the door. He opens it, revealing The Player (Isabelle Adjani) as the knocker, with a momentary breath-cute moment on the lyric “we’re reaching for the stars.” The Player walks in, shuts off the song, and comments, “cowboy music, always tells a story—drunks, whores, broken hearts,” which eases The Driver into answering her question of what he thinks she’s after and makes her eyeful “see you around” exit from his apartment all the more captivating. 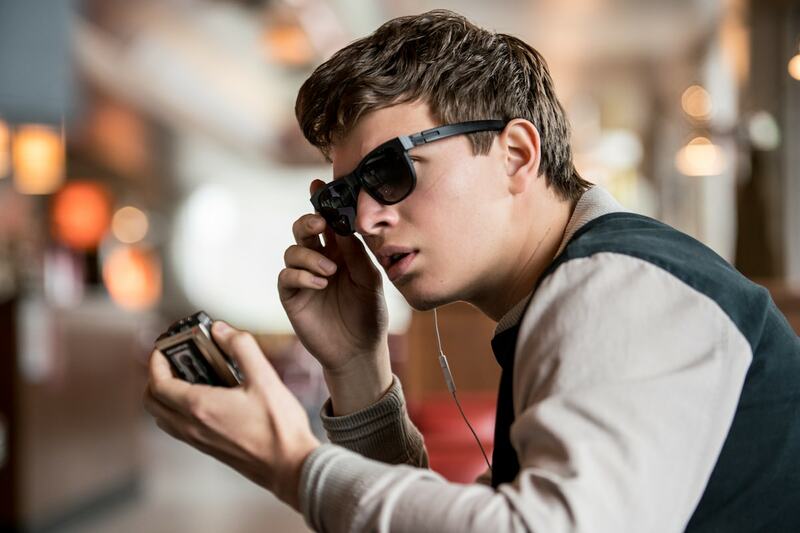 In “Baby Driver,” Baby (Ansel Elgort) falls for Debora (Lily James), after having spotted her briefly and then losing her on a coffee run, in a scene that involves a portable audio cassette recorder and a diner-set song and delight-filled discussion that shouldn’t be spoiled for those who haven’t seen the film yet. Though “Baby Driver” doesn’t feature “cowboy music” in the classic sense, the film does use music that aids its story—criminals, good girls and boys, broken and reawakened hearts—and its leading pair do want to head West, that literal plane of a figurative horizon that speaks to freedom and an ever-expanding, ever-hopeful future. As a teenager, Wright sought “The Driver” out after reading Leonard Maltin’s review noting its “great car chases.” This past March and in anticipation of the theatrical release of “Baby Driver,” Wright interviewed Hill for Empire magazine, telling him, “The people who were watching are directors—we watched that movie and were excited and inspired. And I had to make ‘Baby Driver’ just to prove to you that ‘The Driver’ is influential.” This appreciation extends from filmmaking to film curating: Wright has programmed “The Driver” as the first screening of “Edgar Wright Presents Heist Society,” the upcoming repertory series of “22 Solid Gold Heist Movies” including “Gun Crazy,” “The Getaway,” and “Out of Sight,” which kicks off tonight, June 30, at BAM. That’s the thing with Wright. It’s typical and expected for filmmakers to love film, but what’s atypical and wonderful is how shares that passion so openly and in such a welcoming way. His films are drenched in curious details that carry a multi-layered job of sparking the interest of the most basic moviegoer while also satisfying the nerdiest easter egg seekers and the most avid cinema sentimentalists. His style grabs on a visceral level as well as engages the mind’s eye of movies past and present, making even academic film theorists blush with excitement. For both newly-minted and decades-long film fans, Wright stands as a somewhat approachable figurehead, not only making intricately magnificent genre-mashing movies but also encouraging a great many to seek beyond their fandoms, to watch more and more movies. If you haven’t already, go see “Baby Driver,” a few times, and then check out the admittedly non-canon, but wildly fascinating MUBI list “Edgar Wright’s 1,000 Favorite Movies” and follow Edgar Wright on twitter for deep-cut film and music recommendations. This weekend, see “Baby Driver” large and loud on the big screen with a brimming audience, and carry that heart-racing, curiosity-sparking earnest energy into your future film-watching habits. Someday, maybe you too can interview your cinematic hero and say how they excited and inspired you to do or make something truly great.